Pay no single supplement in certain cabin categories. Limited availability on each departure. Expires April 30. Click here for eligible departures. Welcome to Amsterdam. Your Suite Ship® is Ready for Boarding. Flights into Amsterdam must arrive by 3:30 pm. Guests must be on board ship by 5 pm. You may choose to join a Guided Optional Excursion to beautiful Zaanse Schans where you’ll see a wonderful collection of well-preserved historic windmills and Dutch houses. Enjoy dinner and explore the ship on your first night on board. This morning cruise through Rotterdam harbor. CLASSIC Enjoy an afternoon excursion to Gouda. You’ll join a Guided Tour of the town famous for the Dutch yellow cheese that bears its name—as well as stroopwafels (syrup waffles), Gouda candles, and beautiful city center. Take some free time to relax on the harbor-side in Rotterdam with an artisan beer, a slice of appeltart (Dutch apple pie), and a koffie verkeerd, a typical Dutch drink of half coffee, half milk. Take a bike from your ship to explore Rotterdam and the surrounding area. Later, enjoy live entertainment on board. DISCOVERY Visit the Arboretum Kalmthout where you will admire an amazing variety of plants, tree and flowers. You may choose to join a Guided Optional Excursion to the nearby capital, Brussels—considered home to the European Union, and admire its magnificent palaces and cathedrals. You might prefer to take time on your own to indulge in Antwerp’s signature Belgian waffles and crêpes—or explore this bike-friendly city from its old wharfs to its legendary diamond district. Later, enjoy live entertainment on board. DISCOVERY Visit the Zwin Nature reserve with its unique landscapes and birds. You may choose to join a Guided Optional Excursion of Bruges to explore its canals, cobbled streets and medieval buildings. You’ll see its crisscrossed canals, the 13th-century belfry of Market Square, and charming patrician houses. CLASSIC Join a Guided Walking Tour of the historic merchant city of Middelburg—with its 15th-century gothic Town Hall. You’ll learn about the spice trade of this Dutch harbor capital of Zeeland, its prosperity in the Dutch East India Company trading, and origins as a stronghold city. Enjoy its winding cobbled streets and canals that circle Old Town. Spend some free time biking or walking through Middelburg to sample Babbelaar cookies, fries, or beer before cruising to Veere this afternoon. DISCOVERY Join a Guided Tour of the Delta Works, the largest flood-protection system in the world, and a miracle of modern technology. Later, enjoy live entertainment on board. . Enjoy a free morning on your own to explore the well-preserved fortifications of this historic town. ACTIVE Join your Avalon Adventure Host for an early jogging in Willemstad. DISCOVERY Later, enjoy a Cheese Tasting on board as you prepare to sail to Amsterdam. DISCOVERY Get up early today, not to miss the opportunity to visit the world’s largest flower auction. DISCOVERY Access Amsterdam’s secret gardens hidden behind the brick façades – a unique opportunity as they are normally closed to public. On this garden-and nature-themed Tulip Time cruise, visit spectacular Keukenhof near Lisse, Antwerp’s Botanical Gardens, and small, hidden-away private gardens in Amsterdam. This scenic river cruise begins in Holland’s modern capital of Amsterdam. This 700-year-old city offers classic architecture, cafés, and restaurants to explore, as wells as the legendary canals and bridges crisscrossing the city. Set sail for destinations in Holland and Belgium, and cruise through Rotterdam’s harbor, noted as the world’s busiest port. Garden enthusiasts will delight in the breathtaking colors of Keukenhof, also known as the “Garden of Europe.” With 70 acres of parkland and lakes, it’s one of the world’s largest flower gardens. 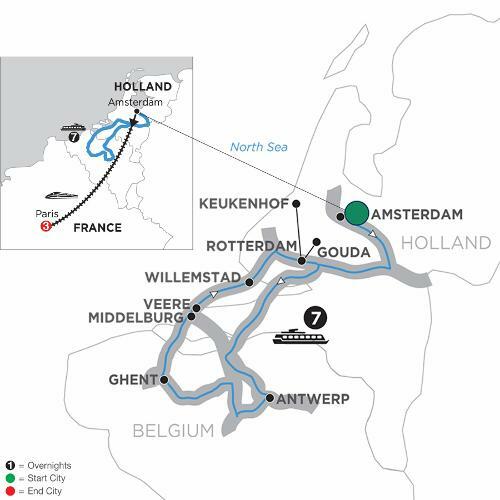 Alternatively, an excursion to the city of Gouda, famous for its cheese, is available. Next, sail to Antwerp, Belgium’s second-largest city, with ancient buildings and monuments combining with modern architecture. Visit this medieval port or alternateively join a visit to a Botanical Garden. In Ghent, join a local expert for a guided tour of the city, including a visit to St. Baaf’s Cathedral, housing important works of Flemish art. Return to Holland, and visit the historic trading port of Middelburg. See its gothic Town Hall, Abbey Tower, and bustling Market Square. You’ll marvel at the technical miracle of the 6-mile-long Delta Works, a storm flood barrier constructed after 1,800 people drowned in the floods of 1953. This beautiful and historic springtime river cruise brings you in Holland’s capital city for a canal cruise along the elegant grachten, or a visit to some of the city’s best-kept secret garden. Your European vacation with a high-speed train transfer to spend 3 nights in Paris—“The City of Lights.” Enjoy guided sightseeing of this iconic city, and spend another day at your own pace to experience the wonderful cafés, museums, and legendary cityscape in the most romantic city in the world. Your Local Host® is available with recommendations and assistance in making the most of your free time in Paris—as part of your Monograms Paris vacation package. Additional Price Details: Port charges: $182.